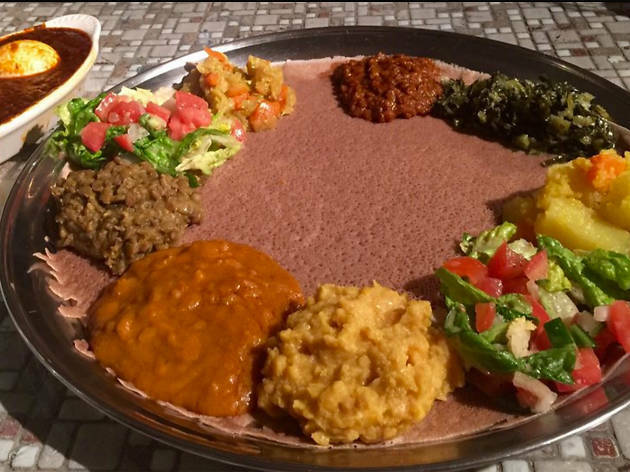 As one of Little Ethiopia's recent newcomers, Lalibela opens earlier than most of its counterparts on the block, offering breakfast on Thursday through Sunday well before the standard 11am. Stop by for Genfo, a wheat porridge with Ethiopian-spiced butter, or Enqulal Fir-Fir—scrambled eggs topped with sliced jalapeno. 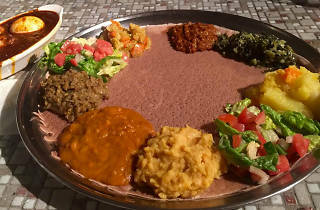 The sage-scented restaurant also makes some killer lunch and dinner items: Sambusas stuffed with lentils, grilled onion, jalapenos and herb fillings; Somali Kitfo, which is finely chopped and seasoned beef; and Ajebush, a house special that combines a variety of meat and veggie dishes along with Aybe Ethiopian cottage-cheese. Bonus? Lalibela is BYOB with zero corkage fee.